This is a prequel to Legends from The Warlock's Chair - Ravengaard. A place of magic and adventure. Long ago when the world was young the Faerie races ruled far and wide across the lands of the Earth. Then with the coming of Man, they disappeared into myth and legend. But they had survived, hidden away in the secret places known only to a very few humans. Eighteenth century England. The Harcourt family leave the clamour and filth of London for the peace and quiet of rural Shropshire. But for those who live at Ravengaard Manor life has never been peaceful or quiet. Soon the three Harcourt children find their lives changed forever by the magical lands that surround the hills of The Warlock's Chair. This is their first adventure. They meet the water dragon Mirrorglow who takes them to the mystical underwater world of Wyr'anthos. 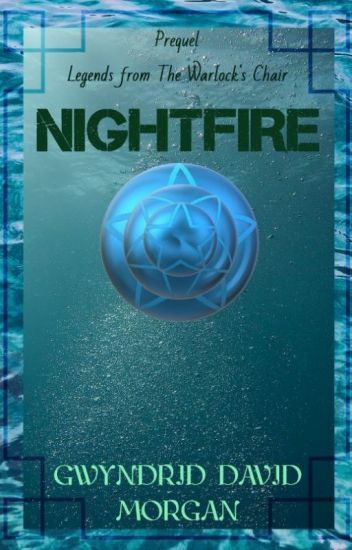 They learn of the Qrill, evil crab-like warriors who have kidnapped her son Nightfire and are holding him prisoner. And they set out to invade the Qrill citadel and rescue him before they can put their evil plans into operation. It is a short story, the first one I wrote for my children. I have given it a bit of a tweak. But they had not been the only races to inhabit the Earth. For in the dark places deep beneath its surface, star spanning demon creatures awoke from their age-old sleep. They brought with them ancient star crossed magic's and sciences that had been born in the cold and darkness between the galaxies. They used them to build an empire. A massive underground city called the Crypt. Slowly their numbers grew, they became stronger. Then they turned their eyes towards the surface world. Soon they came into conflict with the Elves and a war raged. It proved long and costly for both sides. But gradually the Elves pushed back the demon creatures. Back to the Crypt. Where they sealed them away with chains of magical energy. Over time they were forgotten, consigned to the Elven histories. But the demons did not forget. Deep in their underground lair they seethed and raged, awaiting a time when they could escape their imprisonment. With the Empire in chaos following the war with Ravengaard and the return of the Chained. The Elves hoped for a time of peace and tranquillity. A time free from war and conflict. They would use it to rebuild their kingdom. Then once again the Elven Empire could rise up and take its rightful place at the head of the Faerie races. But others are using the turmoil for their own ends. Using it to sow seeds of mistrust and lies amongst the population. Lord Arilach and his Helven rise from the shadows, spreading their pestilence throughout Ellyonia. As disorder spreads across the land, Prince Dauld seeks to wrest power from the Elven Council and take back his dead fathers crown. So begins a race against time to prevent a civil war that will tear apart the Elven lands and destroy them forever. "It's your decision who you become." The small town of Ostwall never saw much excitement - not until a group of curious kids uncover a mysterious murder and disappearance from over a decade ago that had never gotten solved. Driven by curiosity, they dig deeper, searching for answers to their burning questions. But what they uncover is darker and much more sinister than they ever could have imagined. When an attempted murder as a direct result of the children's sleuthing shakes the town, the young detectives must make a choice: stand and fight against the brewing evil, or run. Perhaps the secrets buried beneath Ostwall should have stayed that way. An ancient prediction told that there would come a day when the evil known as Ravengaard would return to seek revenge on those who had imprisoned him. And that once again the Faerie Folk would be forced to come out of hiding and face their old nemesis. The prophecy also foretold of three children whose lives would become forever intertwined with that of the Faerie Folk. They would appear in their time of need. Since the beginning of time, the four kingdoms had lived in peace. Every year, their kings had gathered together at the Well of the Father, seeking the council of the Creator Himself. Both Humans and Mythicals had lived in harmony with each other and their Creator. But now, peace is dead. A world-wide war has begun, pitting Mythicals against Humans, kingdom against kingdom, brother against brother. The purest of evils has invaded the world of Euforemalta, tainting hearts with blood-lust and greed. Innocence is lost. "There are some who are beyond redemption." For years, the world of Desmond has been filled with peace. Under the rule of the Immortal One's son, the people of Desmond thrive. And yet, unrest is stirring within the royal family, an unrest that could cause the foundations of the kingdom itself to crumble. Meanwhile, there are hushed whispers. Long awaited plans falling into place. An army assembling for attack. Nothing can stop the inevitable. Two worlds will collide. Desmond will fall. And the rebel will rise. "Trust the Immortal One, and don't die." An uncontrollable darkness has spread over the world of Desmond. Having thwarted his enemies' attempts at dethroning him, the Great Dragon unleashes his fire upon the innocents, killing and enslaving anyone who will not bow their knee to him. With unexpected assets on his side, the beast will not stop until Desmond is purged with fire. And yet in the ashes of the defeated, an ember of hope still remains. The son of the Immortal One is coming.